I always thought it would be cool to roll around in my red Kenworth Semi with my best pal Bear the chimp. Fantasies of BJ McKay aside, having a primate for a best friend maybe isn’t as cool as I imagined. Not only is hurling feces around uncool, but ever since Travis the chimp attacked a woman in Connecticut last February, the government banned owning primates in the USA. Recognizing a void whereby American’s can not own a Gorilla, a Chimp or a Monkey, Powertraveller aptly named their product line so you could not only lay claim to owning a monkey, you can even carry one around in your pocket. For my needs, the powermonkey and the powermonkey eXplorer fit the bill. Consisting of a small charger and solar slave, the powermonkey eXplorer has an LED on the charger that shows when it’s charging as well as how much charge is left. 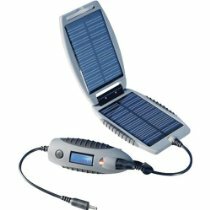 When kept in just 6 hours of full sunlight, the solar slave will charge the battery/charger pack enough to refuel an iPhone three times. Adapters for power sockets around the world are included in a carry bag. Also provided are adapters for iPod, PSP, mini-USB, standard Nokia and Sony-Ericsson phone charger attachments and many more. Thanks for that Lawrence! Coming soon from the home of powermonkey is the minigorilla – a portable charger for netbooks … Check out the website for more information.